A few months ago we inherited two nice pieces of furniture that my granfather made for my mother years ago. They are two end tables for the front room. We didn't have any coasters for drinks, so I thought I would whip up something really quick. And I mean really quick. When I take a quilt off of Gemma, the longarm, there are usually long strips of fabric from the backing and long strips of batting left over. 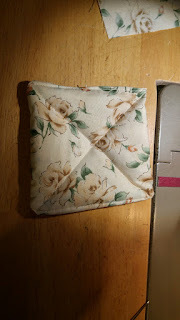 I'm sure that people trimming up their quilts, even from quilting on a domestic machine or by hand will also have these types of pieces left over. I know I did when I was quilting in that manner. They were the perfect width for coasters. I just cut a couple squares of batting to the size of coaster I wanted, then cut a rectangle of material slightly wider and a bit more than double the length. 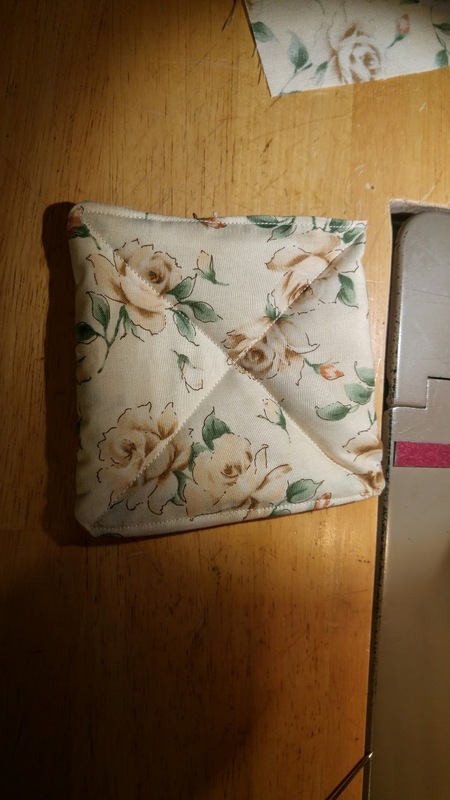 Folded the material in half long ways, put batting squares on top, then turned over and sewed three open sides almost closed. Left a couple inches at end so I could turn them. Turned them right side out and stitched a square through all layers, after closing up the area on the side where I turned them. 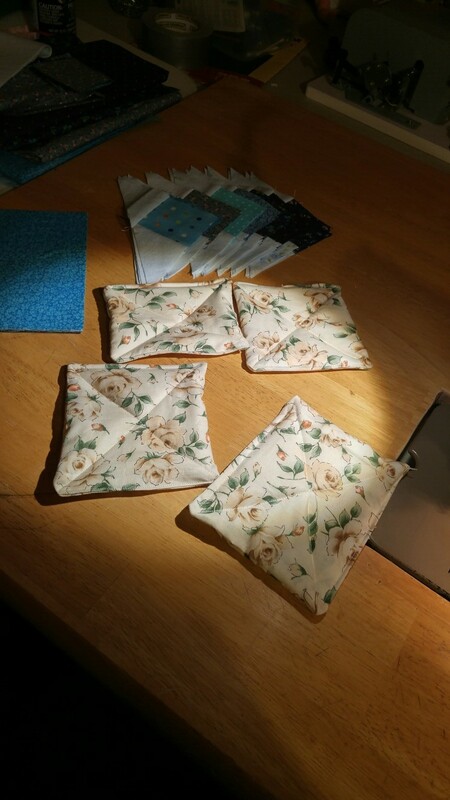 Here they are, along with some pieces of the quilt for Johanna that I was working on. As you can see, they are not uniform in size at all. I did not care about that. I just want to protect the furniture. I also hold no illusions that these may not really be coasters, but are actually chew toys for Addy. We shall see... haha. And that, my blog friends, is why I did not take oodles of time making them perfect.